Ht / Wt: 6'3" / 212 lb. 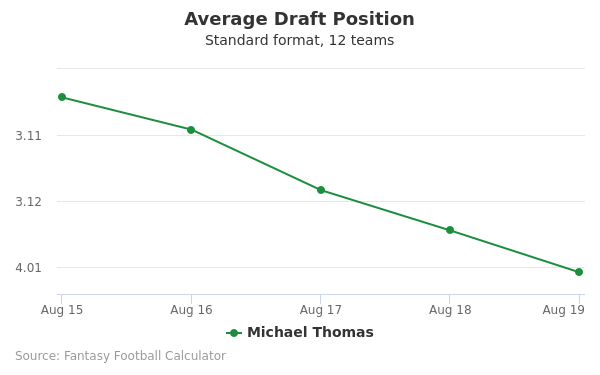 Michael Thomas's fantasy value is measured by his average draft position (ADP) in fantasy football mock drafts. 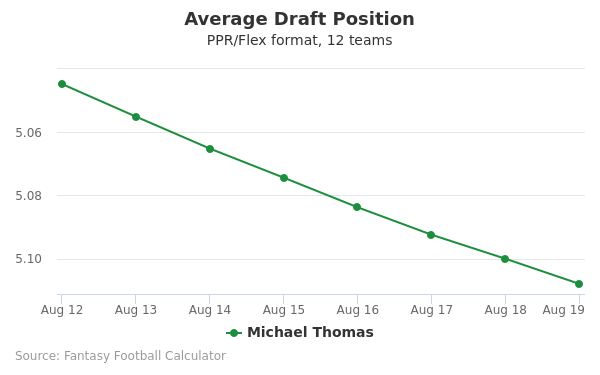 In recent drafts, Thomas's current ADP is 2.01, which indicates that his fantasy outlook is to be the 1st pick of the 2nd round, and 12th selection overall. 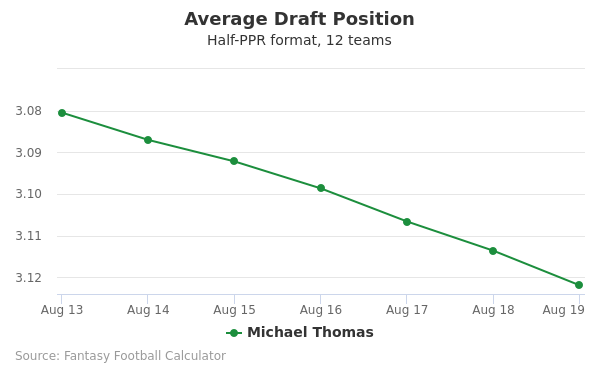 The code below will display a graph that updates every day to show the ADP data for Michael Thomas for the past 30 days in 12-team PPR leagues. Draft Joe Mixon or Michael Thomas? Draft Michael Thomas or Odell Beckham Jr? Draft Michael Thomas or Tyreek Hill? Draft Michael Thomas or Travis Kelce? Draft Dalvin Cook or Michael Thomas? Draft JuJu Smith-Schuster or Michael Thomas? Draft Antonio Brown or Michael Thomas? Draft Michael Thomas or Nick Chubb? Draft Michael Thomas or Pat Mahomes? Draft Michael Thomas or Mike Evans? Draft Marlon Mack or Michael Thomas? Draft Michael Thomas or Zach Ertz? Draft Michael Thomas or T.Y. Hilton? Draft Damien Williams or Michael Thomas? Draft Leonard Fournette or Michael Thomas? Draft Adam Thielen or Michael Thomas? Draft A.J. Green or Michael Thomas? Draft Michael Thomas or Sony Michel? Draft Keenan Allen or Michael Thomas? Draft George Kittle or Michael Thomas? Draft Mark Ingram or Michael Thomas? Draft Aaron Jones or Michael Thomas? Draft Amari Cooper or Michael Thomas? Draft Michael Thomas or Phillip Lindsay? Draft Derrick Henry or Michael Thomas? Start Joe Mixon or Michael Thomas? Start Michael Thomas or Odell Beckham Jr? Start Michael Thomas or Tyreek Hill? Start Michael Thomas or Travis Kelce? Start Dalvin Cook or Michael Thomas? Start JuJu Smith-Schuster or Michael Thomas? Start Antonio Brown or Michael Thomas? Start Michael Thomas or Nick Chubb? Start Michael Thomas or Pat Mahomes? Start Michael Thomas or Mike Evans? Start Marlon Mack or Michael Thomas? Start Michael Thomas or Zach Ertz? Start Michael Thomas or T.Y. Hilton? Start Damien Williams or Michael Thomas? Start Leonard Fournette or Michael Thomas? Start Adam Thielen or Michael Thomas? Start A.J. Green or Michael Thomas? Start Michael Thomas or Sony Michel? Start Keenan Allen or Michael Thomas? Start George Kittle or Michael Thomas? Start Mark Ingram or Michael Thomas? Start Aaron Jones or Michael Thomas? Start Amari Cooper or Michael Thomas? 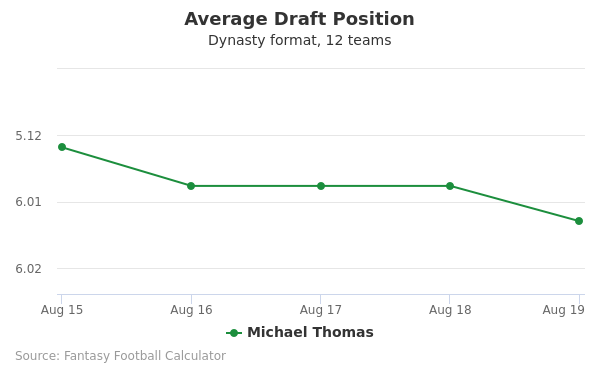 Start Michael Thomas or Phillip Lindsay? Start Derrick Henry or Michael Thomas? Michael Thomas, who is was born on march 3, 1993 in Los Angeles, California. He attended high school at Woodland hills. One of his biggest highlights was during his senior year, where he led the state with one thousand six hundred fifty six yards. That same year, he also scored twenty one touchdowns. in receptions with fifty four for seven hundred ninety nine yards. In January 2016, he announced his intent to enter the 2016 NFL Draft. He was drafted by the New Orleans Saints a few months later. Despite a projection of being picked in round two or three during the NFL Combine, there was a of forward thinking optimism regarding his NFL career. His height, weight, and speed made him perfect for the position. He also had a strong vertical push that would intimidate even the strongest of cornerbacks. However, the agents also noted that he would be easily intimidated by the more aggressive cornerbacks. Thomas was drafted for his rookie NFL season with the New Orleans Saints on April 29, 2016 when he signed a four year contract with $2.6o million guaranteed salary. He started in the 2016 season against Oakland Raiders. The season ended on a good note with him setting team records in for a rookie in touchdowns, receiving yards, and receptions. In fact, Thomas has had such a successful first season that many are questioning why he was not higher up in the draft picks. He quickly learned to work well with the quarterback. Aside from the season ending records, another highlight during the season was running one hundred fifty four yards against the 2017 Super Bowl qualifiers, Atlanta Falcons. Another question many are asking is why Thomas was not on the Pro Bowl roster. The lack of promotion is being chalked up to politics. He is the nephew of NFL receiver Keyshawn Johnson. Beginning in his college career, Houston Texans star, DeAndre Hopkins mentored him. Follow Michael Thomas on Twitter here.